Listing of careers with the Department of Natural Resources including full-time positions with the Parks, Recreation and Historic Sites Division. Information, tools and links to help you get involved in the Georgia State Parks volunteer program. Full-Time Interpretive Ranger positions are posted on the DNR Job Vacancy Announcement. Please check the Announcement link frequently for the most recent postings. Each spring/summer Georgia State Parks and Historic Sites hires seasonal and part-time interpreters to conduct interpretive programs and recreational activities for park visitors. 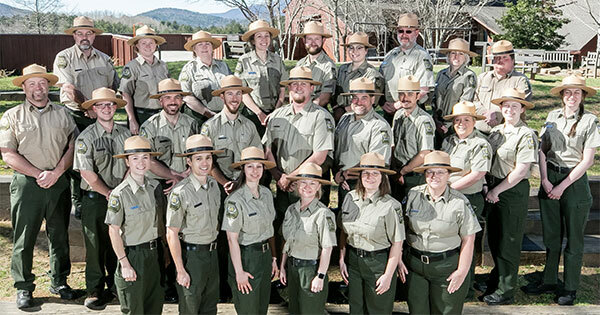 A seasonal interpreter's responsibilities include leading hikes or tours, conducting nature programs and campfire programs, leading games and other recreational activities and conducting a Junior Ranger Day Camp for children. Part-time interpreters conduct interpretive programs and recreational programs as well as planning and coordinating special events and working with visiting school groups. Part-time positions are year-round with fewer work hours during the winter months. All new interpreters are required to attend a three-day orientation. Lodging and meals are provided at the three-day training. The pay rate for seasonal and part-time interpretive staff is $9–$10/hour. Some sites have free housing available at the park—refer to the availability chart. A completed college degree is not required. Areas of study that would be most appropriate include Outdoor Recreation and Interpretation, Environmental Education, Natural Resources, Biology/Ecology, History or other related field. Previous experience in a related field is desired or experience in public relations, customer service and public speaking. Applicants must have strong communication skills and be able to work independently. Please email Ellen Graham at Ellen.Graham@dnr.ga.gov with any questions. Georgia State Parks & Historic Sites set up this program to recruit college students for internships, leading to full-time employment with one of the best state park systems in the country. The internship opportunity offered by PRHS is designed to cover the total operations of a state park, including visitor services, maintenance, programming, safety and security, and internal administration. In serving as an intern with PRHS, the individual will be, in effect, a representative of PRHS just as a fulltime employed associate. At parks with large staffs, interns will see that associates are often assigned specific areas of responsibility and at parks with smaller staffs; interns will see that associates are more likely to be cross trained and responsible for a variety of areas. While all parks operate under the same administrative procedures, the actual onsite operations vary greatly. Parks include various attributes that may be natural, recreational, cultural, and/or historical. Junior or Senior year of BS degree. Provide a syllabus or letter from school to outline. Requires 40-hour work week for 168 days; or, 29-hour work week for 3 months. The number of hours is dependent on the availability at the site and the student. Enjoy the natural environment and customer service. Upon receipt, Intern Applications are sent to the four Region Offices in the state park system where they are reviewed and considered for placement if there is a vacancy. Applicants will only be contacted if there is a vacancy and if they are considered for an interview. Applicants should also consider applying for part-time positions filled at the Park/Historic site level as well by visiting a Georgia State Park or Historic Site and applying in-person for any part-time positions that may be available at the Park/Historic Site level. Individuals that are interested in an un-paid internship in order to meet an academic requirement should complete the Intern Acknowledgement Form and submit the form to the Georgia State Parks and Historic Sites Human Resources Coordinator using the contact information at the bottom of this page. The Trainee and MIT opportunity offered by PRHS is designed to cover the total operations of a state park or historic site, including visitor services, maintenance, programming, safety and security, and internal administration. In serving as a Trainee or MIT with PRHS, the individual will be, in effect, a representative of PRHS just as a fulltime employed associate. At parks or historic sites with large staffs, Trainees and MITs will see that associates are often assigned specific areas of responsibility and at parks/historic sites with smaller staffs; Trainees and MITs will see that associates are more likely to be cross trained and responsible for a variety of areas. While all parks and historic sites operate under the same administrative procedures, the actual onsite operations vary greatly. Parks and historic sites include various attributes that may be natural, recreational, cultural, and/or historical. Trainee positions are part-time, 29-hour per week positions filled at the local Region and Park level as positions become available. If you would like to apply for a Trainee position, please apply below. Upon receipt, Trainee Applications are sent to the four Region Offices in the state park system where they are reviewed and considered for placement if there is a vacancy. Applicants will only be contacted if there is a vacancy and if they are considered for an interview. Applicants should consider applying for full-time positions that are posted on the DNR Job Vacancy Announcement. Please check the Announcement link frequently for the most recent postings. Applicants should also consider applying for part-time positions filled at the Park/Historic site level as well by visiting a Georgia State Park or Historic Site and applying in-person for any part-time positions that may be available at the Park/Historic Site level. Manager-In-Training positions are full-time positions and are assigned to one of the four designated hosting locations (Fort Mountain, A.H. Stephens, Stephen C. Foster or Florence Marina/Providence Canyon) and subject to move to any site in the state based on the Division’s needs. The full-time MIT positions work 40 hours per week, allowing individuals to gain needed experience and knowledge more quickly than a part-time position. Graduates interested in the MIT program will need to complete a state application as well as a letter of interest in the program and submit electronically to Robyn Carter via email robyn.carter@dnr.ga.gov to be considered for future opportunities. Upon receipt, applications will be reviewed and considered if there is a vacancy. Applicants will only be contacted if there is a vacancy and if they are considered for an interview.